The Seattle IPMS club did a themed Schneider Race what if during one of their contests a few years ago. They brought them down to the OC Nats in 2007 where I got pics. Having something like this at a show like SMW (though probably wouldn't be this year) would make a very cool display, especially if people built them in flying mode and they set the table with some pylons, etc. There are more pics in the folder if you want to search around. Wish I'd hung onto that green Spitfire floatplane I did some time ago. EEEBAAAY . I know that weight limit is a bit on the high side, but that's the point: you don't want (possibly amateur) designers paring structural weight down to the point of flimsyness on something that can generate jet levels of aerodynamic loads. Is anybody else familiar with the Speedbirds book and websites? Got "something" finished in just two days, what amazes (and slightly scares) me... pics to follow soon, here and in the Finished Aircraft section. Ladies and gentlemen: I present to you 'The Jägermeister'. Muahahaha! 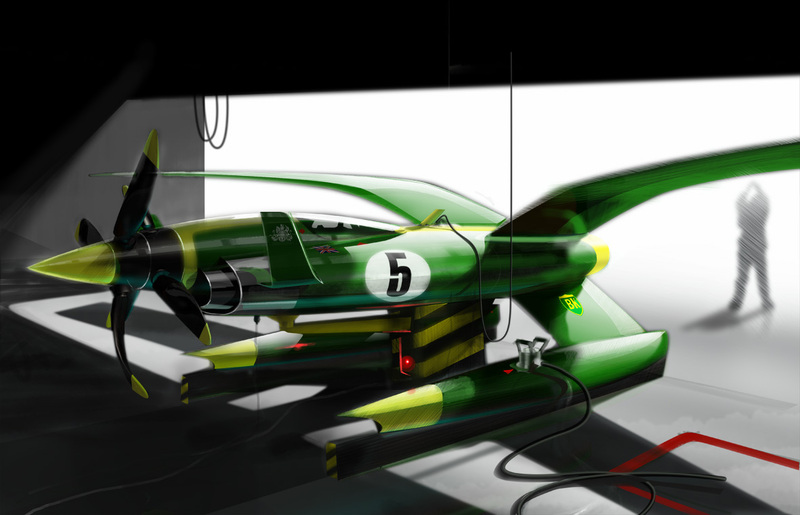 The aircraft that became known as ’The Jägermeister’ was an ambitious racing aircraft project from Germany, that took part in the US National Air Races at Reno during 1967-69. The Jägermeister was built from a disassembled He 100D wreck which was found in 1962. It was found during constructions at the Heinkel plant at Bremen, buried in the ground, probably during the final days of WWII before Allied troops took over the site. The aircraft was in poor condition, but complete and still structurally intact. The find was a minor sensation, since none of the few He 100 built were known to have survived the Second World War – but unfortunately no public funding for restoration could be achieved. In 1964 Heinkel finally sold the airframe to a private owner, the company Mast-Jägermeister SE and its respective owners, the Findel-Mast family. Mast was (and still is) famous for its herb flavored 70-proof (35%) liqueur Jägermeister, which was first brought to market in 1935. The Wolfenbüttel-based company had been sponsoring car racing, and as an innovative PR measure it was decided to re-build the He 100D and attack the absolute air speed record! What sounded like megalomania had a sound basis: The Heinkel He 100 was a German pre-World War II fighter aircraft design from Heinkel which proved to be one of the fastest fighter aircraft in the world at the time of its development. But the design was not ordered into series production, less than 20 prototypes and pre-production machines were built. Re-building the aircraft proved to be difficult, though: Because there were no complete surviving examples, and since many factory documents - including all blueprints for the He 100 - were destroyed during a bombing raid, there was limited specific information about the aircraft’s design and its unique systems. The most significant feature of the original He 100 design (which was missing in the later D variant, though) was an evaporative cooling system. This installation under the wing surfaces and without a draggy radiator bath for the liquid-cooled Daimler Benz engine allowed a very clean airframe and high aerodynamic efficiency. For the re-built aircraft, this revolutionary system was to be re-constructed, as well as an original Daimler Benz DB 601 engine, tuned for high performance. The latter was expected to yield around 2.000hp instead of the original, pre-war 1.200hp, even though for just short periods. Despite these challenges the project was tackled and the aircraft re-built as a civil high speed race plane. This reconstruction was done at Vereinigte Flugtechnische Werke in Hamburg, an association of many former German aircraft manufacturers, including Heinkel. The resurrected He 100D was christened ‘Jägermeister’ and made its maiden flight in August 1966, bearing the civil registration ‘D-WILD’. But by then the idea of attacking the air world speed record had been dropped – despite the theoretical potential of the aircraft to break the 800 km/h (500 mph) barrier. Funds for the project from the Mast family were reduced, and eventually the finished aircraft was sold to the United States. 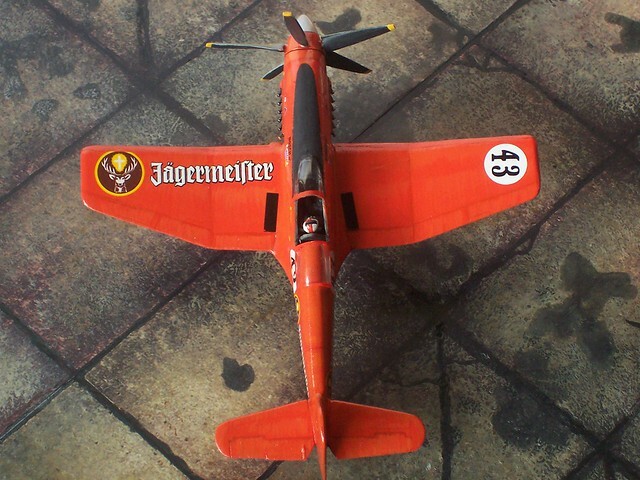 The aircraft kept its all-orange livery, though, as Mast-Jägermeister SE was still a sponsor and hoped for PR in the USA as a potential new market. In September 1967 and with the American pilot George Fransworth at the controls, ‘The Jägermeister’ made its debut at Reno’s National Championship Air Races in the Unlimited Class with the grid number ‘43’, where it raced against several much bigger warbirds. The compact and slender aircraft looked diminutive between the much larger Mustangs, Corsairs and Sea Furies - but thanks to its good aerodynamics the aircraft was very competitive, despite only half of the “Big Birds’” power, and even though extra weight had to be added in order to reach the 4.500 lb minimum empty weight limit for the Unlimited Racer class! During the 1969 Reno Air Races, The Jägermeister suffered a major engine failure. While Farnsworth could keep the aircraft under control and bring it down, the landing attempt ended in disaster and the airframe had to be written off. 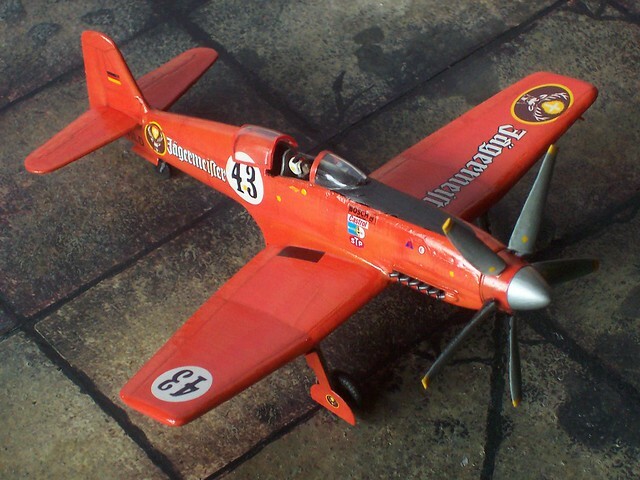 Primiraly, this fictional Unlimited Class Reno Air Racer was a contribution to an air racer group build at whatifmodelers.com, but also a nice distraction from military vehicles/aircraft. You rarely have the chance to turn a weapon into a sport item. Conceptually it was clear from the start that I wanted to build something that would be plausible/realistic, still with a twist. When I wondered about a potential German type for the Reno Air Race after WWII (where a lot of US, British and recently some Soviet warbirds were used), I passed the 'typical candidates' of Bf 109 or Fw 190 and settled for the unlucky pre-war He 100. Originally, the He 100 had been a rival to the Bf 109 and the He 112, and it was definitively the best aircraft of both of these. The real He 100 flew for the first time in early 1938, and it was used for record attempts (e .g. on a 100km round course, and also for the absolute speed record - and the eight prototype even reached 746,61 km/h (462,58 mph)! Anyway, the Bf 109 was preferred and the He 100 became a passed opportunity. Since the He 100's DB 601 engine was reserved for the Bf 109, the He 100 was not 'allowed' into German service and serial production and only a few He 100D (slightly modified, with a new cooler and an enlarged tail fin) were built - even though the type was offered for export and license production, e .g. to Japan or the Soviet Union. The fifteen built aircraft were primarily used for propaganda purposes, or ended up as local defense of the Heinkel plant in Rostock-Marienehe. Around the fuselage, any sign of armament disappeared. Clipped wings are a common practice on racing warbirds, as it reduces drag and G-forces in tight turns, so the wing span was reduced and new wing tips sculpted. The new propeller comes from a Griffon Spitfire: the spinner from a Pavla aftermarket kit, the propeller blades from a Special Hobby kit. In order to fit the slightly bigger diameter spinner onto the tiny He 100 fuselage I had to cut the latter by about 3mm, I wanted to use the original lines instead of adding a fat nose with putty. The propeller was mounted with a metal axis in a styrene tube, so that it could rotate freely. The cockpit was taken OOB, but a modern pilot from an Academy kit was used - this pilot wears a jumpsuit and a 'bone dome', but no oxygen mask, so it is a perfect choice for a low altitude racer. The canopy actually is a rear canopy part from a Hobby Boss P-51, just facing rearwards. Fairings from styrene and putty had to be added to make the new piece fit, but its slender like looks much more aerodynamic than the original He 100 part, and such simple modifications are frequently done to warbird racers. The rest of the kit was taken more or less OOB - I just left the water cooler under the fuselage away. The original He 100 did not have this piece either, as the DB 601 was cooled by a complicated but aerodynamically very effective evaporative cooling system - and for short race distances, falling back to this option would IMHO make sense. Actually, this has also been employed in real life Reno Racers, so it's plausible. Well, a German Reno Racer was the idea, and I found a nice livery/sponsor option when I browsed through Germany's touring car history: thorough many years, the Rauch destilery sponsored race cars for their herbal liquor 'Jägermeister', and this old brand has orange as ID color, as well as promiment logos and typo. What else could you ask for? 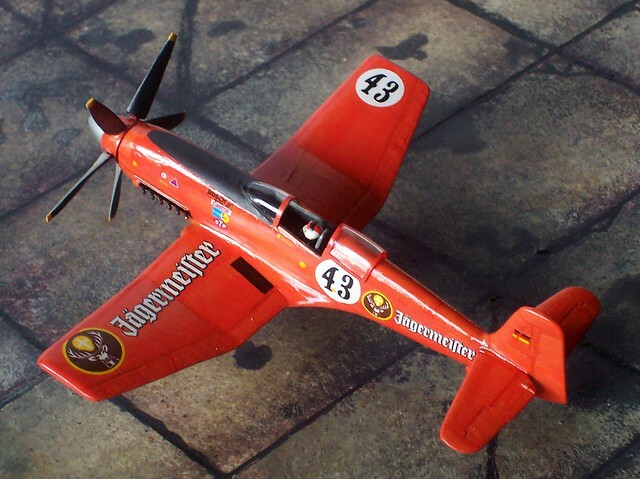 Consequently, the He 100 racer became 'The Jägermeister; in a simple, all-orange livery, just like the respectice race cars. The original tone is, as far as I could find out, RAL 2004 (Reinorange). I used Testors 1595 (Semigloss Orange), since the tone comes pretty close. Panels were later emphasized through light dry-brushing with Humbrol 18 (Gloss Orange), which is slightly lighter, and some Humbrol 132 for depth. 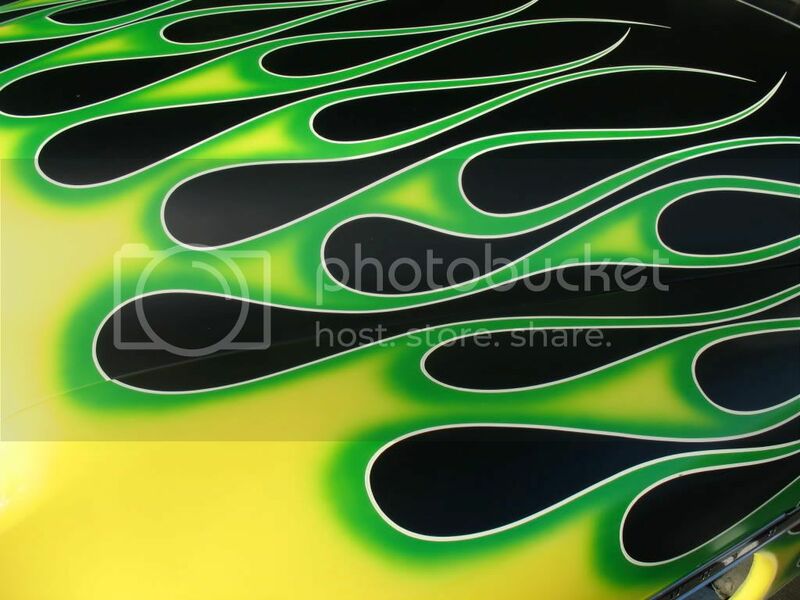 The intention was to make the kit not look too uniform, but not dirty or dented, as air racers are frequently kept clean and in best possible shape. The logos, sponsor stickers and typo come from an aftermarket decal sheet for 1:43 race cars and were deliberately scattered across the aircraft, using real life racers as benchmark for details like grid number positions and orientation. The German registration D-WILD is fictional and was created through single letters from TL Modellbau aftermarket sheets. These also provided the German flag on the tail. The cockpit interior was painted in medium grey. The pilot received a dark brown jumpsuit with white and orange trim, as well as a white helmet. The landing gear and the interior of the wells were painted in Aluminum (Humbrol 56), the wheel discs are black so that they'd not stand out too much. The spinner tip was painted with glossy silver (Humbrol 11), the propeller blades were painted black from behind, light grey from the front, with yellow warning tips. Finally, everything was sealed under a double coat of gloss acrylic varnish. As the kit was built OOB and any ingredients at hand, the whole thing was puzzled together in less than three days – it actually took longer to wait for the right weather condition to take the pictures. It is a nice and colorful whif that would have certainly looked great (if not somewhat dwarfish) among other Reno warbirds? Just some quick pics, it's just finished. Official photo session will follow. And JagerMeister cars are STILL winning too! Wolfgang Kaufman won the DTM Revival race at the Nurburgring at the weekend in his Porsche 935, orange rules OK. Most of the decals seem to be made by a French firm called Virages. You can also find lots of them on ebay, or check slot car specialist stores - most of the 1:43 and 1:24 decals are intended for slot car racers who want to pimp stock race cars or "drive their own real race car".